For those who knew me in college, I have always pride myself for being experimental with hair. I tried a lot of things: straightening, full bangs, side bangs, no bangs, cutting it to pixie, growing it out then doing asymmetrical, sporting a bob, then having an undercut. I also experimented with colors such as red, orange, yellow, copper, burgundy, and purple. I didn't want my hair to irritate my son (as a newborn, up until now). I didn't want something high-maintenance. I just didn't have time to think about what to do with my hair. It's been a long time since I got my hair done. Of course, there are still regular trips to the salon that I take. But to have it colored? Fun fact: I taught Bobby to color my hair. As a couple before, we'd buy random hair color at the department store and start coloring each other. Some people say it's odd that we do that, while others compliment Bobby for knowing how to. But around a week ago, I received a special Mothers' Day treat from Piandré to have my hair done. Honestly didn't expect it but lucky to have been part of this! 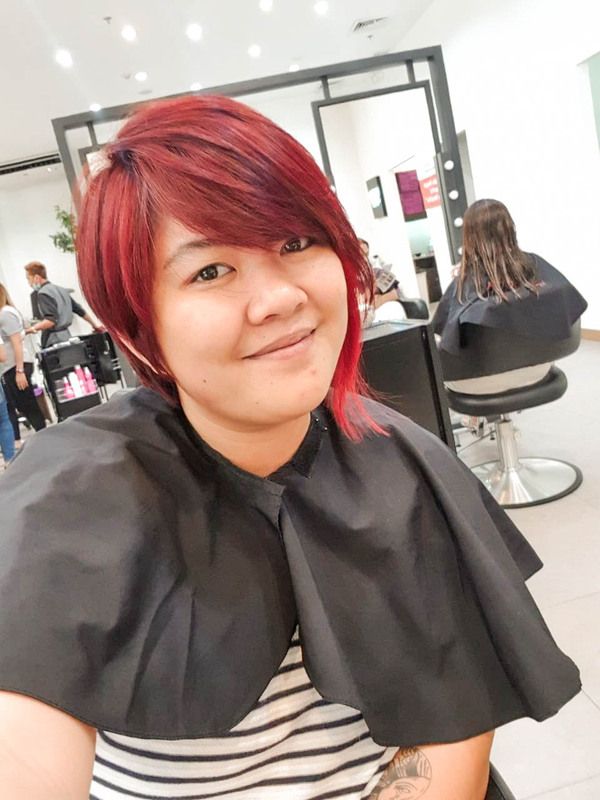 Rosalinda "Linda" Zamora Francisco started Piandré back in 1987 along Amorsolo Street, Makati, hoping to capture the Makati executives, while channeling the popular high-end salons (called “beauty parlors” then). By 1995, Linda took a chance and opened Piandré along 60 Timog Avenue despite cynics who thought that there was no market in Quezon City. To mark the salon chain’s 30 years of success, Piandré's CEO founded Sharing the Hundredfold ~ a series of projects that aim to help its employees enhance their earnings and make some contributions to institutions. Bobby and I got to U.P. Town Center around 1:30 PM, just in time for my appointment. Originally, I was suppose to do a Seamless Balayage ~ but since my hair was too short, Piandré's Senior Stylist Gina opted for another look. She suggested some highlights and coloring to bring in character to my hair. While waiting, Bobby was also telling me the days he would get his hair done at the Piandré branch in Timog. He remembers always going there as a kid up until college, having only them touch his hair. I only found out about it then! It was a 3-hour process, but we didn't mind. Bobby and I really set this day to just go out, take a break from being parents, and to spend some quality time together while getting my dream hair done. They selected sections of my hair to be highlighted so that the red pops out when we apply. Hair was foiled and applied with the highlights. I have a huge section highlighted just before my ear so that it can serve as a focal point. Waited for 30 minutes to an hour before they took it out. I had a great shade of copper with some highlights - which actually wasn't bad! Like I loved this look too! They applied the red.... First on my roots. After 30 minutes, they started applying to the rest of my hair. 45 minutes after everything was covered up, it was rinsed around 2 times. Blowdry then saw the most beautiful version of red hair I've had in my life. I guess what surprised me most was the Lakmé hair color they applied. I usually am the type to get a stinging sensation in my head, and flakes due to my sensitive scalp ---- but I didn't! I was more surprised with that fact. After doing some research, I learned that Lakmé has an ammonia-free permanent hair color line - which the salon also uses. The brand also infuses treatment in the hair color itself to avoid your hair becoming dull and dry after coloring, or in my case, semi-bleaching. Talking to Ms. Gina, she mentioned that the Piandré branch in U.P. Town Center is owned by the Piandré Salon Multipurpose Cooperative Inc.
She mentions how this was really something they're very appreciative of, especially when other companies don't really give this benefit to their employees. "Sa labing-anim na taon na ako dito, nakakataba ng puso na maitatawag namin amin ito." Kuya Jay, on the other hand, has been in this branch for more than a year now. Though he isn't part of the co-op, he mentions how Piandré really takes care of their employees. From their initiatives and trainings offered, they want to make sure that the staff are given opportunities to widen their knowledge, sharpen their skills, and develop managerial abilities. Sr. Stylist Ms. Gina and her assistant, Kuya Jay! The wonderful people who treated my hair and I with tender-loving care. It’s for their total development. Here, they learn the value of money, cultivate and hone more skills to improve their livelihood. Piandré provides an avenue to enrich their lives through value formation initiatives. Spending the whole afternoon with Bobby, learning about Piandré and their initiatives made our hearts full. I mean, I'm used to hearing chikka, gossip and life stories of the hairstylists who work on my hair --- but here, it was all about how thankful they were that they're a part of this. It's hearing the positivity it brought to the Piandré employees that they're learning a lot about running this business, and knowing the amount of love & support the company is giving to them. When you're getting your hair done in their U.P. Town Center branch, it's not just any ordinary day at the salon. You're helping their co-op be self-sustainable! Plus, I cannot deny the skill and talent their employees and stylists have. Like my hair turned out amazing, and I vowed myself that I'll only let them touch my hair, especially with color! Special thanks to Piandré Salon & Mommy Mundo for this lovely afternoon. or click here to book an appointment!